Last week our HVAC folks uninstalled our UltimateAir RecoupAerator ERV, and installed our new Zehnder HRV ComfoAir 350. This is part 2 of our recent ventilator struggles. Read part 1, Problems persist with our UltimateAir ERV. After the latest issues with our UltimateAir, I contacted Mike Duclos, our energy consultant, and asked his advice in selecting a new ventilator. 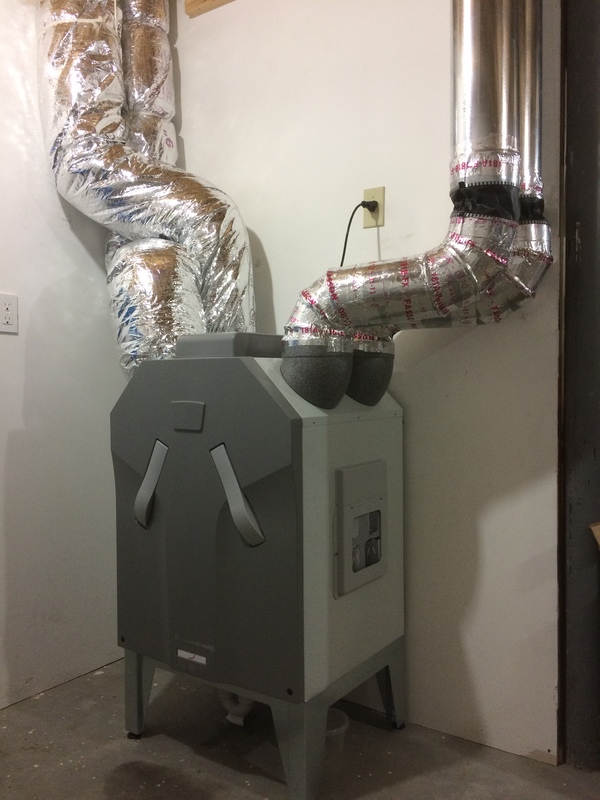 Since the house was designed to use continuous ventilation at 60 CFM and a boost mode for removing extra moisture from the bathroom and odors from the kitchen, he recommended we give the Zehnder a closer look. I knew a Zehnder would be expensive, so I asked about alternatives. Unfortunately, other options such as Venmar and RenewAire do not offer continuous ventilation at specific airflow rates. These units would have to cycle on and off to approximate our 60 CFM flow rate. These units would also require different vents to the outdoors that prevent backdraft cold air from entering the house when the unit is off. The Zehnder can be set to specific air flow rates and run continuously. They also have a unit which is very similar in size and layout, so there’s not a lot of re-ducting required. The pre-heat is integrated inside the unit rather than separate, simplifying the install. We were able to easily convert the 2 circuits for the UltimateAir (one for the pre-heat and one for the ventilator) to one 15 amp 220 volt circuit for the Zehnder. Zehnder offers both ERV and HRV models. When we were designing the house, we didn’t find any overwhelming rational for picking one type over the other. We went with the ERV because that is what UltimateAir made. 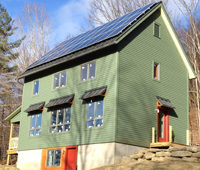 We picked UltimateAir because it was energy efficient and being used in many new net zero homes. But after almost 4 years of ERV use, we decided to try an HRV. We use the ventilator to vent the bathroom and kitchen. Sometimes the ERV was not able to do an adequate job of reducing the moisture in the air. Some humidity in the house is good in the winter, but when I started finding little patches of mold in the corners of the windows, I knew we had too much. Running the ERV in boost for longer periods of time did not seem to help. Working with the folks at Zehnder was a pleasure. Within a week of asking for a quote, I had a new unit sitting in my basement. We paid $1,329 in 2011 for the UltimateAir, not counting the preheater, controller, boost switches and installation. Over the next 4 years we paid just north of that in repairs. UltimateAir did offer us $400 toward the cost of the replacement unit. They have also offered to refund 50% of the original price upon return. I think we netted out spending roughly $2,400 without the refund, or 1,700 when the refund arrives. The Zehnder unit came in at $2,300, plus installation (unknown at time of posting). After everything we’ve been through, it didn’t seem so expensive any more. I’m quite happy with how easy and quickly they were able to swap out the units, less than 4 hours of work including commissioning. If you notice in the picture at the top of the post, they had to swap the exterior air inlet and exhaust ducts. We also mounted the unit on the floor. They don’t recommend hanging them from the ceiling. Zehnder’s often have a large manifold mounted on top. They also don’t recommend hanging them on a wall that does not have a lot of density to muffle any vibrations. And because the unit is an HRV, it needs to be able to drain condensate, so there is a drain at the bottom. 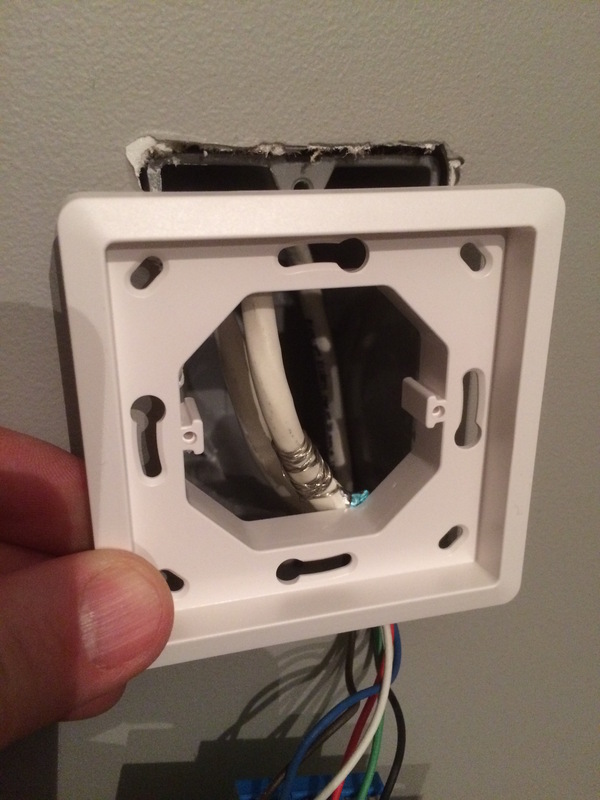 The new 220v outlet can also be seen behind the unit. We were able to reuse the wiring from the unit to the control panel mounted on the first floor, although the control unit is a different size (not the standard US electrical outlet box size). This wouldn’t have been an issue if this was a fresh install. But since this is a retrofit, I now have to decide what to do with the mismatched control panel. I’m really surprised Zehnder US does not have a retrofit patch kit for this. Likewise with the two boost switches in the bathroom and kitchen. Same sizing issue, although these switches are thinner and wireless which is totally awesome. No wires needed. And connecting them to the main control was easy. Commissioning the unit was also a breeze. The UltimateAir required adjusting physical registers on the ventilator which required keen eyesight. The Zehnder is fully controlled from the control panel. The P-menu is a bit awkward, but fairly easy to figure out. I’m guessing in the not too distant future they will have an app for this. Seems silly to have wireless boost switches but I can’t use my phone to commission or make changes on the fly. We’re using the low fan setting on manual mode for now. This fan speed delivers a continuous air flow rate of 100 meters cubed per hour or about 59 CFM if I’ve done my conversion correctly. At this speed the unit pulls about 23 to 24 watts. In boost mode it uses 102 watts. Thus far, we’ve been using the new unit for about 11 days. In that time we’ve done a lot of Thanksgiving cooking, and friends have taken many showers. We’re very happy. Mainly it’s peace of mind. I have more confidence that the unit will just work. After all, it is the lungs of our house. You don’t want to worry about whether your lungs are working. Hi Tim, sorry for the long delay in responding. Did you replace your unit? I couldn’t be happier with our Zehnder. I’m in the process of building a off grid high performance home inspired by your house( thanks for all the work you did posting and sharing!). Now that you have lived in your house for so long are satisfied with just the HRV or would you have installed separate bath and kitchen fans? Very good question. Our experience is that the ERV left too much moisture in the house, and the HRV too little. At the time, there was no simple way to add a bath fan without adding other complications or cost. I’m pretty sure there are better options on the market today. Good luck with your building adventure and let us know what you decide to do for ventilation.